Antibiotics are agents made from living microorganisms, synthetic manufacturing, and genetic engineering that are used to inhibit specific bacteria. They can be bacteriostatic, bactericidal, or both. Others include ketolides, lincosamides, lipoglycopeptides, macrolides, and monobactams. Bacteria are microorganisms that invade the human body through many routes like respiratory, gastrointestinal, and skin. Human immune response is activated once bacteria invade the body. As the body tries to rid itself of bacteria, classic signs of inflammation (e.g. swelling, heat, redness, and pain), fever, and lethargy begin to show up. The goal of antibiotic therapy is to decrease the population of invading bacteria to a point at which the human immune system can effectively deal with the invader. Aminoglycosides are a group of antibiotics indicated for infections caused by gram-negative aerobic bacilli. They were replaced by newer, less-toxic drugs in treating less serious infections because these drugs have potentially serious adverse effects. Exert bactericidal effect through inhibition of protein synthesis in susceptible strains of gram-negative bacteria. Specifically, they bind to a unit of the bacteria ribosomes and cause misreading of the genetic code leading to cell death. Infections caused by susceptible strains: Pseudomonas aeruginosa, Escherichia coli, Proteus spp., Klebsiella-Enterobacter-Serratia group, Citrobacter spp., and Staphylococcus spp. Serious infections susceptible to penicillin when penicillin is contraindicated. This age group is very sensitive to GI and CNS adverse effects of antibiotics. Therefore, it is important to monitor their nutritional and hydration status while on therapy. Oral candidiasis as a superinfection is common in this age group which makes eating and drinking difficult. Fluoroquinolones are associated with damage to developing cartilage and are not recommended for growing children. In addition to this, pediatric dosages should be double-checked to decrease the risk for adverse effects. Most of all, parent education is important in cutting down the unnecessary use of antibiotics in children. This age group has the tendency to cure simple manifestations with antibiotics. 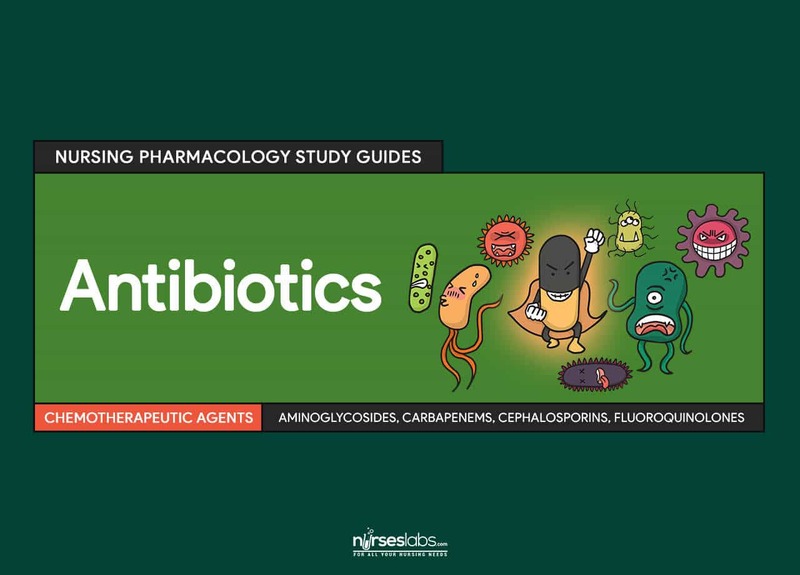 Therefore, it is important to educate them that antibiotics are effective only for certain bacteria and not for simple manifestations like common colds, which may be viral. Storage of unused pills for future infections and sharing antibiotics with symptomatic friends should be avoided and emphasized in health teachings. Assessing the problem and obtaining appropriate specimens for culture is especially important with this population. Older patients may be more susceptible to adverse effects of antibiotic therapy. Renal or hepatic disease. Can be exacerbated by aminoglycosides and may interfere wih metabolism and excretion of these drugs. Preexisting hearing loss. Can be intensified by toxic drug effects on the auditory nerve. Active infection with herpes or mycobacterial infections. Can be worsened by the effects of an aminoglycoside on normal defense mechanisms. Myasthenia gravis or parkinsonism. Can be exacerbated by the effects of a particular aminoglycosides on the nervous system. Lactation. Aminoglycosides are excreted in the breast milk and can potentially cause serious effects in the infant. Amikacin should not be used for longer than 7-10 days because it is particularly toxic to the bone marrow, kidneys, and GI. Streptomycin is only for special situations because it is very toxic to the 8th cranial nerve and kidney. Carbapenems are a relatively new class of broad-spectrum antibiotics effective against gram-positive and gram-negative bacteria. Exert bactericidal effect by inhibiting cell membrane synthesis in susceptible bacteria, leading to cell death. Serious intra-abdominal, urinary tract, skin and skin structure, bone and joint, and gynecological infections. Infections caused by susceptible strains: S.pneumoniae, H.influenzae, E.coli, K.pneumoniae, B.fragilis, P.mirabilis, P.aeruginosa, and P.bivia. Known allergy to carbapenems or beta-lactams. Seizure disorders. Exacerbated by drugs. Meningitis. Safety is not established. Lactation. Not known whether drug can cross into breast milk or not. Ertapenem is not recommended for use in patients younger than 18 years of age. Meropenem is associated with development of pseudomembranous colitis and should be used in caution in patients with inflammatory bowel disease. Valproic acid: Carbapenems reduce serum valproic acid and this can increase risk of seizures. Meropenem and probenecid can lead to toxic levels of meropenem. Cephalosporins were first introduced in the 1960s. There are currently four generations of cephalosporins, each with specific spectrum of activity. These drugs are similar to penicillins in structure and activity. Exert bactericidal and bacteriostatic effects by interfering with the cell-wall building ability of bacteria during cell division. Therefore, they prevent the bacteria from bio synthesizing the framework of their cell walls. First-generation cephalosporins are effective against the same gram-positive bacteria affected by penicillin G, as well as gram-negative bacteria P.mirabilis, K.pneumoniae, E.coli. Second-generation cephalosporins are effective against previously mentioned strains as well as H.influenzae, E.aerogenes, and Neisseria spp. These drugs are less effective against gram-positive bacteria. Third-generation cephalosporins are effective against all of the previously mentioned strains. They are relatively weak against gram-positive bacteria but are more potent against gram-negative bacilli, as well as S.marcescens. Fourth-generation cephalosporins are active against gram-negative and gram-positive organisms, including cephalosporin-resistant staphylococci and P.aeruginosa. Known allergy to cephalosporins and bea-lacams. Cross-reacions are common. Hepatic or renal impairment. These drugs are toxic to the kidneys and could interfere with the metabolism and excretion of the drugs. Pregnancy and lactation. Potential effects on the fetus and infant are not known; use only if benefits clearly outweigh the potential risk of toxicity to the fetus or infant. Reserve cephalosporins for appropriate situations because cephalosporin-resisant bacteria are appearing in increasing numbers. Perform culture and sensitivity test before start of therapy. Phlebitis and local abscess at the site of IM injection and/or IV administration. Fluoroquinolones are a relatively new synthetic class of antibiotics with a broad spectrum of activity. Interfere with the action of DNA enzymes necessary for growth and reproduction of the bacteria. Has little cross-resistance but misuse of this drug for a short time will lead to existence of resistant strains. Treating infections (respiratory, urinary tract, and skin) caused by susceptible strains: E.coli, P.mirabilis, K.pneumoniae, P.vulgaris, M.morganii, P.aeruginosa, H.influenzae, S.aureus, S.epidermidis, N.gonorrhoeae, and group D streptococci. Ciprofloxacin was approved in 2001 for prevention of anthrax infection in areas that might be exposed to germ warfare. It is also effective against typhoid fever. Photosensitivity and severe skin reactions so advise patient to avoid sun and ultraviolet light exposure and to use protective clothing and sunscreens. Iron salts, sucralfate, mineral supplements, antacids: increased therapeutic effects of fluoroquinolones. Administration should be separated by at least 4 hours. Penicillin was the first antibiotic introduced for clinical use. Various modifications were subsequently made to address resistant strains and to decrease drug adverse effects. Penicillinase-resistant antibiotics were developed to address penicillin-resistant bacteria. Exert bactericidal effect by interfering with the ability of susceptible bacteria to build their cell walls when they are dividing. These drugs prevent the bacteria from bio synthesizing the framework of the cell wall, and the bacteria with weakened cell walls swell and then burst from osmotic pressure within the cell. Treatment of streptococcal infections (e.g. pharyngitis, tonsillitis, scarlet fever, endocarditis). Known allergy to penicillins and cephalosporins. Renal disease. Drug excretion is reduced. Pregnancy and lactation. No adequate studies on the effect on fetus but these drugs can cause diarrhea and superinfectons may occur in the infant. Pain and inflammation at the injection site can occur with injectable forms of the drugs. Sulfonamides are drugs that inhibit folic acid synthesis. Inhibit folic acid synthesis required as precursors of RNA and DNA. They competitively block paraaminobenzoic acid to prevent synthesis of folic acid in susceptible bacteria that synthesize their own folates for the production of RNA and DNA. Treatment of infections caused by susceptible strains: C.trachomatis, Nocardia, and some strains of H.influenzae, E.coli, and P.mirabilis. No longer used much but they remain an inexpensive and effective treatment for UTIs and trachoma, especially in developing countries where cost is an issue. Can also be used in treatment of sexually transmitted diseases. Sulfasalazine is used in treatment of ulcerative colitis and rheumatoid arthritis. Known allergy to sulfonamides, sulfonylureas, or thiazide diuretics. Cross-sensitivity can occur. Renal disease. Increased toxic effects of the drug. Pregnancy. Can cause birth defects. Lactation. Increased risk for kernicterus, diarrhea, and rash in infants. Tetracyclines are semisynthetic antibiotics based on the structure of a common soil mold. Inhibit protein synthesis leading to inability of the bacteria to multiply. The affected protein is similar to protein found in human cells so these drugs can be toxic to humans at high concentrations. Treatment of infections caused by susceptible strains: Ricketssiae, M.pneumoniae, B.recurrentis, H.influenzae, H.ducreyi, Bacteroides spp., V.comma, Shigella spp., D.pneumoniae, and S.aureus. Adjunct in treatment of protozoal infections. Use in caution in children below age of 8. Can potentially damage developing bones and teeth. Hepatic or renal dysfunction. Drugs are concentrated in the bile and are excreted in urine. Antimycobacterials are antibiotics used in the treatment of infections caused by pathogens responsible for tuberculosis and leprosy. Mycobacterium tuberculosis causes tuberculosis, the leading cause of death from infectious disease in the world. Mycobacterium leprae causes leprosy or Hansen’s disease, characterized by disfiguring skin lesions and destructive effects on the respiratory tract. Act on the DNA and/or RNA of the bacteria, leading to lack of growth and eventually to bacterial death. Treatment of tuberculosis and leprosy. Pregnancy. Adverse effects on fetus. Safest antituberculosis regimen in pregnancy isoniazid, ethambutol, and rifampin. Hepatic or renal dysfunction. Interfere with the metabolism and excretion of drugs. Rifampin, rifabutin, and rifapentine can cause discoloraion of body fluids from urine to sweat and tears. They may stain orange-tinged and may permanently stain contact lenses. Ketolides is a class of antibiotics introduced in 2004. It is indicated for treatment of mild to moderate community-acquired pneumonia caused by susceptible bacteria. Lincosamides are similar to macrolides but they are more toxic. They are used to treat severe infections when penicillin or other less toxic antibiotics cannot be used. Lipoglycopeptides are antibiotics introduced in 2010. They are used to treat complicated skin and skin-structure infections caused by susceptible strains of gram-positive organisms. Macrolides are antibiotics that interfere with protein synthesis in susceptible bacteria. They are used to treat respiratory infections and urethritis in adults and otitis media and pharyngitis/tonsillitis in children. Eythromycin is the drug of choice for Legionnaire’s disease and infections caused by C.diphtheriae, Ureaplasma spp., mycoplasma pneumonia, and chlamydial infections. Monobactam antibiotics are indicated for treatment of gram-negative enterobacterial infections. Ketolides and lincosamides block protein synthesis leading to cell death. Ketolamides are structurally the same with macrolides. Lipoglycopeptides inhibit bacterial cell wall synthesis by interfering with polymerization and cross-linking of peptidoglycans. They bind to the bacterial membrance and disrupt the membrane barrier function causing bacterial cell death. Macrolides bind to the bacterial cell membrane and change protein function. This prevents bacteria from dividing and cause their cell death. Monobactam disrupts bacterial cell wall synthesis and promote leakage of cellular contents and cell death. Ketolides: telithromycin with antiarrhythmics and antilipidemics can cause serious adverse effects. It might also cause potentially fatal respiratory failure in patients with myasthenia gravis. Lincosamides: use in caution in patients with hepatorenal insufficiency. Usage in pregnancy and lactation is only indicated if benefit clearly outweighs the risk to the fetus or neonate. The same is true with lipoglycopeptides, macrolides, and monobactams. Macrolides: food in the stomach decreases absorption of oral macrolifes. Antibiotic should be taken on an empty stomach with a full, 8-oz glassof water 1 hour before or at least 2-3 hours after meals. Monobactams: incompatible in solution with nafcillin, cephradine, and metronidazole. Assess for the mentioned cautions and contraindications (e.g. drug allergies, CNS depression, CV disorders, etc.) to prevent any untoward complications. Perform a thorough physical assessment (other medications taken, CNS, skin, respirations, and laboratory tests like renal functions tests and complete blood count or CBC) to establish baseline data before drug therapy begins, to determine effectiveness of therapy, and to evaluate for occurrence of any adverse effects associated with drug therapy. Perform culture and sensitivity tests at the site of infection to ensure appropriate use of the drug. Conduct orientation and reflex assessment, as well as auditory testing to evaluate any CNS effects of the drug (aminoglycosides). Risk for infection related to bone marrow suppression (aminoglycosides) and repeated injections (cephalosporins). Ensure that patient receives full course of aminoglycosides as prescribed, divided around the clock to increase effectiveness and decrease the risk for development of resistant strains of bacteria. Monitor infection site and presenting signs and sympoms throughout course of drug therapy because failure of these manifestations to resolve may indicate the need to reculture the site. Provide safety measures to protect the patient if CNS effects (e.g. confusion, disorientation, numbness) occur. Provide the following patient teaching: safety precautions (e.g. changing positions, avoiding hazardous tasks, ec. ), drinking lots of fluids and to maintain nutrition even though nausea and vomiting may occur, report difficulty breathing, severe headache, fever, diarrhea, and signs of infection. Monitor patient response to therapy (decrease in signs and symptoms of infection). Monitor for adverse effects (e.g. orientation and affect, hearing changes, bone marrow suppression, renal toxicity, hepatic dysfunction, etc). Which group of antibiotics is not recommended for growing children because they are associated with damage to developing cartilage? A pregnant patient in labor has concurrent intra-abdominal infection. Culture test result revealed the pathogen as B. fragilis. She is pre-eclamptic and is receiving intravenous magnesium sulfate supplemented with valproic acid. Which antibiotic is supposed to be ideal but is contraindicated in this case? It is indicated for infections caused by B.fragilis. However, this can reduce serum levels of valproic acid and can increase the risk of seizures in pre-eclamptic patient. Which group of relatively new antibiotics can cause respiratory failure in patients with myasthenia gravis? Given in high doses, these drugs can treat meningitis. Based on the mechanism of action, the nurse would be right to expect that in this group of antibiotics patient may also have anemia. This antibiotic inhibit synthesis of folic acid so bacteria would not have materials needed for their DNA or RNA. 2. A 24 y/o woman was admitted for Shigellosis and is currently receiving tetracycline. Upon history taking, she admitted to be taking OCPs and is having multiple sexual partners. What should be included in the nurse’s health teaching? A. Patient should use condoms. C. Patient should increase the dose of her OCPs to maximize its effectivity. D. Patient should see a psychiatrist. 2. Answer: A. Patient should use condoms. Tetracycline decreases the effectivity of OCPs and so patient should use extra form of contraception. 3. Which group of antibiotics is not recommended for growing children because they are associated with damage to developing cartilage? 4. A pregnant patient in labor has concurrent intra-abdominal infection. Culture test result revealed the pathogen as B. fragilis. She is pre-eclamptic and is receiving intravenous magnesium sulfate supplemented with valproic acid. Which antibiotic is supposed to be ideal but is contraindicated in this case? 5. Which group of relatively new antibiotics can cause respiratory failure in patients with myasthenia gravis? 6. Answer: A. Penicillins and penicillinase-resistant antibiotics. 8. Based on the mechanism of action, the nurse would be right to expect that in this group of antibiotics patient may also have anemia.